Three weeks ago I embarked on a seven week journey to visit a few countries in South America. So far it has been an absolute whirl-wind of experiences and sights but unfortunately the culinary side has been lacking. My food philosophy places me in the category of vegetarian when I travel , but on this trip with the exception of fish. My daily food options in Peru included: stale bread, jams, bananas, tea, overly fried eggs or omlettes, fried rice, french fries, fried yucca - a type of peruvian potato (and just about anything else you could imagine fried), occassionally some salad and very salty canned vegetables. If I was an omnivore, I would have had the added option of Lomo Saltado ( an Asian/Peruvian fusion dish of stir-fried beef or chicken, french fries and rice). Now, you may be thinking about why I have not mentioned quinoa. Isn't quinoa from South America? Isn't quinoa a great source of protein for vegetarians? Yes, quinoa is from South America. Yes, quinoa is a great source of protein for vegetarians. But no I was not served or had the option to be served quinoa once. Why, when quinoa is such a great source of protein and other vitamins and minerals, would Peruvians not serve quinoa to their vegetarian foreigners? The answer is quite simply about the current price because of the booming global demand for the product. Sadly, since quinoa has blown up in the western world as our new 'super food', the local non farmers have paid a dear price. A Peruvian informed me that just five years ago one kilo cost 3 Soles (just over 1 USD), but now one kilo will cost a local 20-25 Soles! This is obviously great for the quinoa farmers, but not so great for all other Peruvians. Peruvian food history is very interesting, but a bit lengthy of a discussion for this blog post, so please take my word for it. So although there are interesting origins, current Peruvian food culture is not so interesting as a traveller until you mention one dish - and that is ceviche! Ceviche. Thought to have been established in Peru nearly 2000 years ago, it traces its origins to a Grenadan woman who accompanied the Spanish conquistadors. The dish naturally evolved and today is known as a traditional Peruvian dish - usually eaten as an appetizer, served cold. The preparation is simple, but it is very important that it is prepared fresh to minimize the risk of food poisoning as it requires the use of raw fish. Tradionally you want to use the Sole fish, but you can find different recipes with other fish and seafood too. But back to the process. The raw fish is cured in citrus juice, shredded onion and spiced with aji (a local red Peruvian chili pepper). Naturally the dish is accompanied with complementary flavours such as lettuce, sweet potato, corn, plantain and avocado. In Peru the locals will tell you that you will get the best tasting ceviche when you are visiting a costal city. To name a few major coastal city centres from North to South: Piura, Chiclayo, Trujilo, Chimbote, Lima and Arequipa all serve up this tasty dish fresh. If you travel to Peru you will no doubt be passing by one coastal city - take some time and enjoy a small plate of ceviche, you will be please you did! Rince diced fish and dry thoroughly. Boil water to cook corn and sweet potato. Thinly slice red onion and juice limes. Set aside butter lettuce leaves and cilantro. In a large bowl combine: fish, onion, lime juice, salt and aji. Cover and refrigerate for 20 minutes. Once the corn and potato are cooked allow them to chill. Just before serving mince and stir cilantro into the bowl of marinading fish. Divide the corn, potato and lettuce between four plates. Now scoop out and divide the ceviche between the four plates. Top with sliced chile pepper. Enjoy! I went to a karma yoga class this afternoon. Typically in yoga we are supposed to clear our minds and gently push away the thoughts that come into our heads. This is great since it helps us find meditation in our movements and fully relax our bodies into postures... but this takes practice. Perhaps it will take me years and years of practice as I often find myself thinking different thoughts while I practice. Sometimes I am able to focus completely about breathing into a posture, but quite often I think about things I want to be doing. Today was one of those days where I was thinking about food instead of my practice. My brain was scanning my pantry and gave me an appetite for a grain salad with roasted butternut squash. I left yoga feeling a little more invigorated and had dinner planned. Although I didn't gently push away thoughts, I still consider this to have been quite the productive hour. First you will want to roast the vegetables. Start by pre-heating your oven to 400°F, ensuring there is a rack placed in the middle of the oven. Now prepare the squash and red onion by first removing the skin, followed by dicing into medium sized cubes and slices, respectively. Place the vegetables on a baking sheet, pour 2 Tbsp of oil, and a pinch or two of salt, pepper, thyme, tossing to evenly coat the vegetables. Place the tray in the middle of the oven. Bake for 40-50 minutes, until the vegetables are evenly roasted. While the vegetables are roasting, you can prep the other components of your salad. I would start with the barley - I boiled two cups of quick cook barley in 2 1/2 cups of water (you do not have to cook the barley in broth as you will be tossing the cooked barley in salad dressing which gives it plenty of flavour!). Next, mix together your dressing. Crush and finely mince the clove of garlic, then combine all other salad dressing ingredients in a small mason jar (125mL). Shake. Taste test. Add more salt and pepper if you feel it is required for your taste buds! At this point dice the apple (I used a macintosh, but any apple would work) into small cubes and roughly chop the walnuts (I left mine raw - but toasted would bring another element of flavour to the salad). Once the veggies are roasted and the barley is cooked, combine all the salad components (barley, roasted veggies, salad dressing, apple and walnuts) in a medium bowl and toss. I got this urge the other day to make something Mexican flavoured. At first I was thinking tacos, but we have had tacos several times in the past few months... and the next idea that came to mind was stuffed peppers. I haven't made these in a long time and I have never made Mexican inspired stuffed peppers. Generally, stuffed peppers seem quite fancy to me and they can be dressed up or down for any occasion with flexible stuffing ingredients. All in all, they are great for any dining experience! Now, not everyone is going to have the palate for Mexican stuffed peppers, but not to worry! As I said, the ingredients are flexible, and you can use which ever spice base or stuffing base you like. Just stick to the ratios below and you should be good. You can add meat, chickpeas or lentils instead of black beans; experiment with different types of mushrooms...or no mushrooms; or some chopped nuts - pine or cashew nuts are always good. However, It is always my preference to include rice (or another grain) in the stuffing mix, it adds a nice texture to the stuffed peppers. First things first - get all of your ingredients prepped and chopped. Start by preparing your rice and black beans (if you are using dried beans). You want these two ingredients to be cooked before you start cooking your stuffing for the peppers. Once these ingredients are prepped, start preparing your stuffing. Dice the onion, garlic and mushrooms. Next, get a can of diced tomatoes, drain it, reserving the liquid for later use. Get your spices handy (if you like you can measure them out before hand - I usually just eye-ball the measurements directly into the pan!). Lastly, chop the tops off your four peppers and gut them (I dice the extra pepper flesh that is around the stem and add it to my stuffing mixture). Set the burner to high, heating the frying pan with the oil. Once hot, reduce the heat to medium/high. Put the onion, garlic and mushrooms in the pan. Stir and add your spices. Continue to stir this mixture occasionally until the onions are translucent and the mushrooms have cooked down (15-20 minutes). Next add the tomatoes and juice. Reduce heat to low and continue to stir occasionally for an additional 15 minutes. After this, mix in the diced peppers. Now you are ready to fill the peppers and put them in the oven. Ensure you have a pan with edges that your pepper can be baked in (I lined an 8x8 inch glass pan with 2-3 inch sides with tin-foil). Place your peppers in the pan then fill each, using a spoon, press the stuffing into the peppers (each pepper can have stuffing heaping out of the top). Lightly, cover the peppers with tin-foil. Bake for 1 - 1 1/2 hours (or once peppers have softened). I topped my peppers with a slice of buffalo mozzarella cheese and allowed it to melt for the last couple minutes of cooking. Once cooked, you may top with any desired topping ingredients. I used avocado, tomato and lime juice...cilantro would be nice but I did not have this on hand! Enjoy! This past weekend my boyfriend and I endured an arduous and wet long-weekend along Monkman Cascades Trail, Tumbler Ridge, BC. The hilly 22 km hike-in was long (especially the last 5 km) with some pretty plain scenery of woods the entire way. Also to make matters worse, we packed the power balls in the bottom of our packs by accident, making them inaccessible during the hike to our campsite! With our energy levels waning, we were becoming quite skeptical about the waterfalls being worth the long hike. However, upon our arrival at the campsite, the hike-in faded away. We were greeted by a group of male campers (clearly having a guys weekend, which I felt like I was crashing!) who had a fire going. We could finally pull out a power ball (or three lol) to enjoy around the fire. This made the hike in somewhat worth it and from there, the weekend was great. 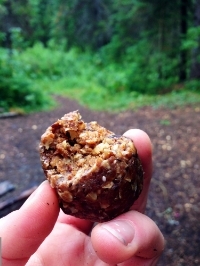 We had to ration the power balls for the hike out so next time I will make sure we have some more. Hope you enjoy this recipe; I know my boyfriend and I did this past weekend! Now, rewinding to Friday, before our departure on this epic hiking trip, we did have a box of Cliff Bars, but to be honest they taste a bit artificial and are excessively sweet. As a result, the power balls were prepared. I came up with an ingredient list and ratios for each ingredient then began mixing. The great thing about this recipe is that all the ingredients can be swapped out for alternatives - as long as you keep the ratios similar, you will be golden. For example, if you know you will be adding an extra 1/4 cup of nuts, seeds or dried fruit, increase the quantity of paste (dates, nut butter and water) in your recipe. More simply, if your mixture ends up too dry (i.e. your balls are falling apart) simply add some more liquid or vice versa for you mixture being too moist. Don't be afraid to experiment! And always make more than you think you will need - these honestly taste amazing! Using a food processor combine the dates, peanut butter and water. Mix on low until these ingredients become pasty. You may need to scrape the sides of your food processor down a couple times during this mixing process. In a separate bowl, combine the rest of the ingredients, adding the date and peanut butter paste. Knead this mixture until all ingredients are incorporated. Remember, you can always add some extra fluid if your mixture is too dry or add some more ground flax if your mixture is too moist! Now you can shape your balls. Using both hands, simply take some of the mixture in the palm of your hand and roll/mold it into a 1 inch ball shape. Volia! I wrapped each ball with plastic wrap after I had let them cool, just to stop them from sticking to each other. This might sound strange, with me dedicating a lot of time to a food blog, but at times I find myself stuck in a food-rut, you know where you end up eating the same things over and over again? Where making a few changes in your diet to make it more interesting appears to be so overwhelming? Maybe I am on my own with this food-rut feeling, but I do think the best way to get out it to make something somewhat out of the ordinary, finding more inspiration from food again. Making my pavlova and these Vietnamese rolls catapulted me out of this little rut last weekend. Something that is key for me is flexibility. Flexibility in cooking makes life much more simple. Granted, these Vietnamese rolls do require at least two essential ingredients (rice paper and vermicelli noodles), the rest is really left up to you! My recipe is still very much Asian inspired but this does not mean you have to follow protocol, you can still experiment with different cultural flavours if you would like. Adding tofu, shrimp or temph are additional options as well. For me, these rolls are the perfect summer appetizer or light lunch. First make your peanut sauce. Finely mince the garlic and place this is a bowl, followed by all the other peanut sauce ingredients. Mix and leave the sauce to rest while you being preparing your rolls. Mise en plat...The key to making vietnamese rolls is to have everything in place before you begin. First boil water to cook your vermicelli noodles, sit them to the side to let them soak (they do not need to be boiled, just simply placed in boiling water). Drain the noodles once they are soft. Next, julienne the carrot, cucumber, bell pepper and avocado. If you are not sure how to julienne your veggies check out this how-to video (https://www.youtube.com/watch?v=3YU1IBLypo0) they end up looking like match sticks. Next, mInce your herbs of choice. Take your first piece of rice paper and swirl it gently around the plate/shallow bowl, submerging all parts of the rice paper until it becomes soft (this will take 20-30 seconds). Once the rice paper has been hydrated, carefully flatten the rice paper onto a clean surface (it tears easily). Now, fill the rice paper with your contents (the herbs, carrot, cucumber, pepper, avocado, noodles, sauces and lettuce). Carefully roll the rice paper (like you would a wrap) folding in both ends as you roll. Repeat this until you have reached your desired number of rolls or you have run out of ingredients. Cut each roll in half and enjoy! Growing up one of my food idols was Anna Olsen. As a child I sat on the kitchen counter watching episode after episode of her show 'Bake with Anna Olsen'. Eventually my parents bought me her two cookbooks, 'Sugar' and 'Another Cup of Sugar', and even took me to Anna's bakery in Niagara, where Anna made me a sandwich, came to sit, chat and sign my books - I was beyond excited! I was so inspired to bake. After a lot of practice and many failed baking attempts I have finally become quite a competent baker. Unlike my cooking, I always follow a baking recipe. Sometimes I make family recipes, but most often I source recipes from other blogs and the food network. This time I sourced from Anna Olsen's archive. These picks are never a disappointment! The original recipe is located at the end of this blog post in the highlighted link. I made a slight adjustment and of course used different fruit. I made two pavlovas assembling them like a cake, putting whipped cream and fruit in the middle and top. The ingredient list represents enough for a two layered pavlova, if you would like to make a single layer, simply half the ingredients. Note: cream of tartar is a stabilizing agent for the egg whites. If you do not have this on hand don't fret! This ingredient is easily eliminated or replaced with an equal amount of vinegar or lemon juice. Pre-heat your oven to 300°F, and prepare baking sheets with parchment paper (once complete, the meringue will be placed on the paper). Now to prepare your meringues! First you will need to separate your egg whites from your yolks (if you are unsure of how this process works, check out this how to video at the following link: https://www.youtube.com/watch?v=aPEUf4Wugyk). Once you have separated your whites, beat them on med-high for a minute (until foamy). Add cream of tartar at this time. Continue to beat egg whites on mid-high, gradually adding 2 cups of sugar, until stiff peaks form. Once egg whites have been whipped fully, fold in corn starch and vinegar. Evenly divide the meringue to make two circles on the prepared baking sheets. Each meringue should be about 8-10 inches in diameter. Place in the oven and bake for 30-40 minutes. Once baked the meringues should be slightly golden. While your meringues are baking prepare your whipping cream. Using a large bowl add whipping cream and vanilla, beating this until it begins to stiffen. Gradually add 4 tablespoons of sugar. Whip cream to stiff peaks, careful not to over-whip! Assembly: Once the meringues have cooled, spread half the whipping cream on one of the meringues (this will become your bottom layer). Next, add fruit on top of the whipped cream. Now, carefully place the second meringue layer on top. To finish off, add the rest of the whipped cream and mixed fruit to the top of your pavlova. Enjoy! My boyfriend is a meat lover. Now I have nothing against carnivores. I do love eating meat if I can ensure that the animal was ethically raised and grass fed (this usually means consuming meat from my mum's farm); but since I am living in a northern city in Alberta, far from my mum's farm, I have extremely limited access to meat that fits my strict criteria, so naturally, I have been living as a vegetarian for almost a year. My boyfriend has been struggling with the new vegetarian diet I imposed upon him, which I can understand. So to help make his vegetarian experience a little easier I put a lot of effort into creating dishes that have a whack of flavour and are still very filling. Pesto and chickpea pasta came to mind, so I rolled with it... My original intention was to make a classic pesto (using pine nuts and basil) and share this with my boyfriend and the online world! Filled with inspiration I headed to the grocery store, list in hand, to purchase a few essential items for creating pesto, specifically, a bag of pine nuts. Upon checkout I was watching my groceries slide over the scanner - the price flashing up on the screen. To my dismay, as my 2 cup bag of pine nuts slid over the scanner the number $37.00 flashed onto the computer screen! Are you shocked? I was horrified, and I quickly had the cashier remove the pine nuts from my grocery bag - I could not justify purchasing 2 cups of pine nuts for over $30.00! I knew I had a large bag of walnuts at home, so I made the decision to make my pesto with a different nut base. 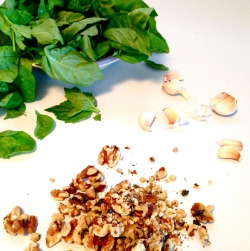 Understandably all nuts and seeds will come at a cost, so if you are at home and would like to make pesto but you don't happen to have pine nuts, or even walnuts on hand, but happen to have some cashews or pecans sitting around, try using these instead. Recipes are not static, they are meant to be played with, adjusted, don't feel trapped by an ingredient list. Just remember that substituting ingredients will result in different flavours, which I think makes recipes more unique and perhaps more suited to your own palate. Whenever I make pesto I always put a pot of water on the stove before I start processing my ingredients, so my suggestion to you is to first select your pasta (this time I used spaghetti) and get a pot of water boiling. While you are waiting for it to boil start your pesto. Ideally you would use a food processor to make your pesto, but it is possible to also use a blender or even mortar and pestle (if you would like some extra exercise)! In the food processor, add the nuts (of your choice) and garlic. Blend on low for a minute, then add the basil, spinach, oil, salt and pepper. Continue to blend the ingredients on low for a few minutes, scraping down the sides when the contents start to build up on the bowl. You want to end up with a smooth pureed texture, and this may take up to five minutes. Taste test your pesto and add some extra salt if you find it a bit bland! Once your pasta is boiled add your desired amount of pesto to the pasta, followed by the chickpeas. Stir and enjoy! Side Note: If my pesto has been sitting in the fridge I usually mix a few spoonfuls of pesto with some water to help break it up so it mixes into the pasta more smoothly. I grew up thinking that spaghetti Bolognese was made with a lentil base instead of ground beef. I am glad that my parents introduced this healthier bolognese alternative to my taste palate at an early age as I think it would have been more difficult transitioning away from the traditional ground beef. To this day I am still not a huge fan of meat in my pasta sauce. You might be wondering why I'm so happy about loving lentils vs meat in my pasta sauce, when meat is a great protein and admittedly quite tasty? Well lentils, like any legume, not only taste amazing but are a great source of protein in addition to being low in fat, full of fibre, vitamins and minerals. If you are used to ground beef in your pasta sauce, this recipe may take some time to get used to - but I guarantee this will become a household favourite if you give it a chance! I always see recipes as being flexible, and this sauce is no exception. You can play around with the ingredients to suit your taste and texture preferences. Often I do not measure my spices, I will add varying amounts and sometimes throw in some extra chilli flakes for a bit of kick! Try substituting and/or adding new ingredients to the mix like carrots and/or peppers. If you like a smoother texture you can also puree the sauce with a hand blender (also known as an emersion blender), or leave thick and chunky if you are in a hurry! Enjoy! Dice onion and garlic and measure out spices (or, if you like, you can add them to the pot by eye). In a large pot, heat olive oil, add the minced onion, garlic, spices and bay leaf. Stir. Sautee onions until translucent and slightly browned about 2 minutes. Add lentils, tomatoes and water to the pot. Stir. Put the lid on the pot and allow sauce to simmer for an hour (some additional time may be needed to thicken the sauce further). After an half-an-hour to an hour give your sauce a stir and a test taste, then add salt as needed. If you are making some pasta to accompany the sauce, cook this now. Put a pot of water on the stove and bring to a boil. Use any pasta you would like, and follow the cooking instructions on the box. Garnish with some fresh parsley and parmesan cheese, if available. I went on a hike this weekend to Tumbler Ridge, British Columbia. It was a great escape from the flat and dusty Prairies of Alberta. The trip was a bit last minute so I did not prepare a snack, instead I brought a generic store bought, high fructose corn syrup, powerbar with me... to say the least it was not very good. This gave me some inspiration (and motivation) to make some homemade high protein granola bars to enjoy during my road trip and hiking adventures on my way to Kelowna, BC next week for my best friends wedding! 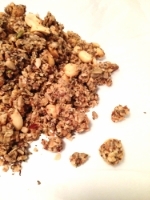 Now, often when people make granola bars they are too crumbly. The key to making granola bars that hold together is honey and brown sugar. Many people may find this much honey and sugar overwhelmingly sweet, my advice, try substituting the brown sugar for pureed dates, which will provide extra flavour, stickiness and nutrients! Feel free to substitute your preferred nuts, seeds, oils and nut butter into your granola bars too. And don't fret if your bars happen be crumbly, worst case scenario you can convert your crumbly bars into plain old granola! 1) Preheat oven to 250 C and line an 8x8 inch pan with parchment paper. 2) Put oil, honey, sugar and peanut butter into a pot. Simmer to melt the sugar. 3) Put all other ingredients in a large bowl and mix together with your hands or a spoon. Add warm oil mixture to the bowl and combine. 4) Pour mixed ingredients into 8x8 inch pan and lightly press down to create an even surface. 5) Bake mixture for 25 minutes in the middle of the oven. 6) Remove from the oven and let cool, then place in the fridge for 2 hours. Remove from the fridge and bring to room temperature. Cut the bars into your desired size, wrap with plastic-wrap for convenience eating on the go! Happy Birthday, Fresh From Scratch! Today is my first blog post so, naturally, I decided to make a birthday cake! This is a fail-safe vanilla cake and buttercream icing. I have made this recipe numerous times in the form of cupcakes and neither my taste testers nor myself have ever been displeased with the final product! The cake is light and fluffy, the icing sweet but not overwhelming. I sourced (and slightly adapted) this recipe from a great blog called the Cupcake Project (link at the end of this post). I used red food dye to make my ombré tones in the sponge and icing. You can choose whichever colour you would like. The cake batter requires more dye to hold a colour (for a reason that I am not sure of). The batter may appear much darker in colour but the intensity will dissipate during the baking. 2) In a bowl combine sugar and seeds from the vanilla bean (to remove the vanilla beans cut the vanilla bean length wise, and scape the seeds from the pod). 3) In a small bowl mix the vanilla bean seeds with the sugar. Use the back of a spoon, move around the bowl and apply pressure to break up any clumps of seeds to help infuse vanilla flavour into the sugar. 4) In another small bowl, whisk together eggs, sour cream, oil and vanilla extract until smooth. 5) In a medium sized bowl mix together cake flour, baking powder, baking soda and salt. 6) Add the sugar and vanilla bean mixture to the flour mixture and mix until well combined. 7) Add butter to the flour/sugar mixture and mix on medium-low speed for three minutes. You will be left with a fine crumb texture (because there is so little butter). 8) Add the egg mixture to the flour mixture and beat on medium speed until just combined. 9) Slowly add milk and mix on low speed until just combined. 11) Bake for 25 minutes and check to see if they are done (this will be when a toothpick comes out without any batter stuck to it). If they are not done continue baking for two minutes at a time. Continue this pattern until they are done. 12) Once baked let the cakes sit for 2 minutes in their pans. After this time remove them from the pans and place on cooling racks. 1) Mix together sugar, butter, milk, vanilla seeds and vanilla extract until they are blended and creamy. 2) You may need to add more icing sugar to obtain your desired consistency (more stiffer). 3) Add a couple drops of dye to your buttercream icing at a time and stir to combine. Continue to add drops until you reach your desired shade. 1) Once the cakes have cooled shave the top of each cake to make each layer even . 2) Use the buttercream icing and create a crumb coat over the entire cake. 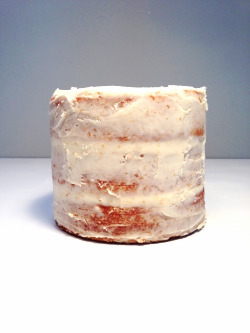 4) Remove cake and complete icing the cake in desired ombre layers. Don’t you agree ombré cakes always look so elegant? Have you ever tried creating one? If not, give it a go. Happy Baking! Thanks for visiting! I created this blog to share my love for food, cooking and baking. I hope you find some inspiration!